The New Zealand organic sector, now worth $600 million, is booming. Organics Aotearoa New Zealand’s biennial market report to Parliament earlier this year showed a booming industry, growing twice as fast as conventional farming. Organics still only constitute 2.2% of our collective grocery bill, but since the most frequently purchased organic goods are fresh produce, this figure is almost certainly masked by the trade in market and roadside stalls, and from specialty grocers. Although 80% of us, at least occasionally, make an organic purchase, only 7% have a complete understanding of what ‘organic’ really means. With organics, no part of the system exists in isolation – from soil micronutrients to ethical working practices. There are no quick fixes. Instead, dedicated farmers, makers and distributors plunge their hearts and minds, sweat and toil, money and skill, into producing traceable, sustainable, chemical-free food. Their labour of love is in service of an ideal that filters from the very earth beneath their feet, through plants, animals, people and community. Marion Thomson has been up to her elbows in organic dirt for decades. She’s a community educator, teaching free, marae-based horticulture courses through EIT. And as Organic Farm New Zealand’s certification manager, she’s responsible for auditing and accrediting organic certification for the domestic market from Gisborne to Dannevirke. There’s a number of different regulatory bodies involved: Asure Quality, the government verification body; BioGro, NZ’s preeminent and largest certifier; OFNZ, BioGro’s regional, domestic wing; Demeter, the anthroposophical assurance; and Hua Parakore, certification based on kaupapa Māori under Te Waka Kai Ora. Currently, there is no regulation on use of the word ‘organic’. Some grow under organic principles but don’t have the time, money or inclination to jump through hoops for certification. They rely on local familiarity and trust regarding their practice and produce. Whether consumers take their word depends on the relationship they have with the grower or distributer. From Marion’s seat on the National Council of the Soil and Health Association, she’s campaigning to restrict use of the highly marketable ‘Organic’ label to products that adhere to an independently verified production standard. Past and neighbouring land use, soil quality, crop types and inputs used, and resource management are all parts of the picture. Strictly regulated, plant and sea based inputs are permitted in organics, but no chemical sprays or pharmaceuticals can be used on land or animals. A fundamental principle of organics is building healthy soil. BioRich diverts organic waste from industry, converting into a valuable resource what once caused huge environmental headaches and methane emissions in landfill. Scott urges caution over the largely unseen issue of food security. While horticulture, arable and livestock farming are secure, closed systems, globalisation has disenfranchised large scale, commercial vegetable seed production. Although heritage organic seeds are produced at small scale and preserved locally, they are unavailable at the scale required for bigger, competitive enterprise. So, oddly, seed produced in New Zealand is sent to Europe for processing, then bought back by NZ farmers. Andy rejected pressure to overstock his land and then rely on pharmaceutical intervention to squeeze a diminishing profit margin. Although his meats are now sold at a premium, he argues this is the true price of healthy, ethically-produced food. The Bostock name is synonymous with organics in Hawke’s Bay. They grow most of New Zealand’s organic apples, for both domestic and export markets, as well as other premium produce. 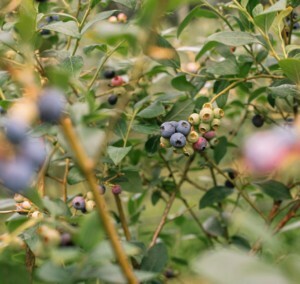 As conventional orchardists living on-site in the 1990s, the Bostocks became concerned by carcinogenic effects of organophosphates, which were sprayed liberally in those days. To safeguard the health of their own family, including young sons Ben and George, they converted their orchard to organic. This changed the course of New Zealand’s apple industry and influenced Ben and George into careers rooted in organics … hence Bostock Brothers Organic Free-Range Chicken. Although their chickens account for just 0.3% of the national market, they provide respite from an industry that is largely unregulated and dominated by just four large corporations. “We’re basically a roadside stall compared to the rest of the industry,” says George. Their point of difference lies in their organic status. Smaller flock sizes avoid the need to routinely feed the antibiotics used routinely elsewhere. Chefs credit birds grown slower without hormones for producing superior tasting meat, as well as allaying ethical concerns. As well as a wealth of organic producers, Hawke’s Bay needs distribution networks to supply demand. Te Awanga local, Krystie Miller, is bringing her organic passion to the people. 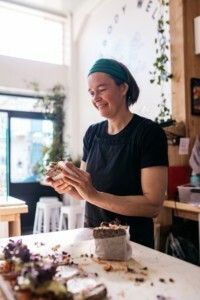 More than just a place to shop, Krystie’s vision is to create a food hub, where people come for social interaction, meet growers and makers, get educated through talks and demonstrations. She hopes by inspiring a community invested in health, the desire for organics and wholesome food will grow. Consumers come to them for assurance and education. “We have a trust relationship with our customers. We’ve been doing this a long time. 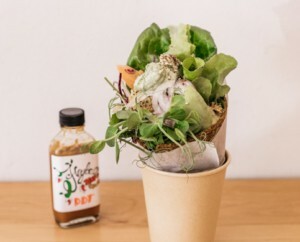 We have really strong ethics, and are really concerned the things we sell are okay.” It’s a mantra backed by the shop’s BioGro organic certification, allowing them to sell uncertified products, as long as they’re satisfied of progeny and products are labelled correctly. The process of creating living food from the ground up has been paramount in Gretta Carney’s long journey with organics. In her work establishing the Hua Parakore certification standard, she acknowledges the metaphysical connections to the land organics can offer. It’s a holistic system: kaupapa (values) inform tikanga (practices) to produce ngā hua (outcomes). Hua Parakore informs how Gretta runs her café and market stall, Hapī Ora. Both she and her co-founder are health practitioners who uphold a principle of food as medicine. She promotes a change of thinking towards taking control of our own wellness. Gretta was an early proponent of a vision to see New Zealand fully organic by 2020, and although she knows this is now unobtainable, she still has high hopes for Hawke’s Bay. Like many others working every day in the small but dedicated organics world, she sees this way of thinking as a big opportunity for the Bay, socially and economically. Bostock New Zealand: John Bostock is the largest producer of organic apples in the country. Plus a host of other produce. Coming soon, Bostock Organic Wine. 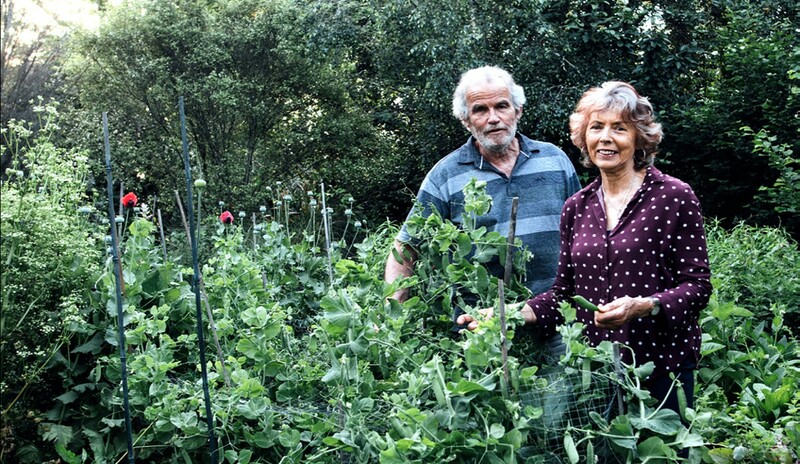 Lawson’s True Earth: Scott and Vicki have been growing organic vegetables and berry fruit since the 1990s. Hohepa: Biodynamic vegetables, meat and dairy with a social conscience. Also offer a line in natural crafts and candles. The Chef’s Garden @Epicurean: Clyde Potter grows and distributes greens to home and commercial chefs throughout the region. Te Koha: Biodynamic horticulture specialising in heritage, disease resistant fruit. Check out Clare and Erin’s juice and apple cider vinegar. JJ’s Organics: Uncertified organic produce grown at their property on Riverbend Road. Bremdale Coastal Gardens: Supplying vegetables, fruit, nuts, herbs and honey from Nuhaka. The Organic Farm: Wide range of meat products and small goods at Hastings shop and the Farmers’ Market. Bostocks Free Range Organic Chickens: Providing poultry for restaurants, supermarkets, butchers and markets around the country. Mangarara Family Farm: Organic beef, lamb and pork in Elsthorpe. Lindsay Farm: Raw organic milk from a family-run farm in Waipukurau. Sentry Hill Organics: cow and sheep milk dairy products from Central Hawke’s Bay. They also produce Pasture Poultry Free Range Organic Eggs. Humming Hill Farm: Supplying homes, supermarkets and cafés from their free-roaming 400 strong flock in Havelock North. Beady Eye: produced on Heather Smith Radley and Nick Radley’s biodynamic farm at Tauroa Station in the Tukituki Valley. As well as eggs they have a diverse range of fruit, crops and animals. They are invested in biodiversity and sustainability education. Cornucopia Organics: One-stop organic shop on Heretaunga Street. Chantal Organics: Napier-based organic supermarket and wholesalers since 1983. 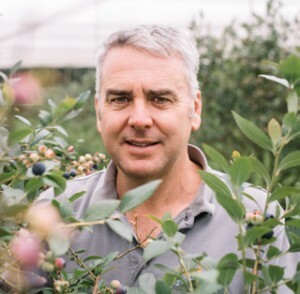 Founder Peter Alexander has recently sold to national organic chain, Huckleberry. Norton Road Organics: Peter Alexander’s farm shop, stocking home-grown fresh produce, juices and dry goods. Te Awanga Organic Market: Mid-week market for fresh produce by the beach. 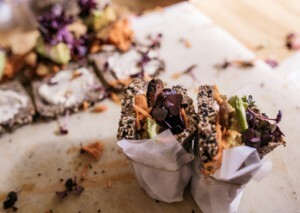 Bostock Organic Kitchen: Fresh, wholesome, reasonably priced lunches. Hapī Kai Co-Op: Ready-to-eat meals and store cupboard staples designed for health. Taste, Cornucopia: Family-friendly café cuisine. The Wholefood Kitchen @ Chantals: Plant-based meals and treats. 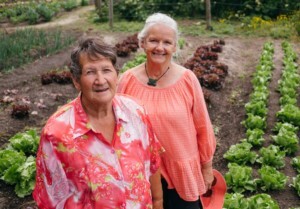 Kahikatea Farm: Organic plants, flowers and vegetables grown on permaculture principles. They also have a strong educational component. Links Organics: Seasonal organic plants and produce sold at the Napier and Hastings Farmers’ Markets. Setha’s Seeds: Setha Davenport and Roddy Branagan run courses as well as growing and selling heritage seeds and garlic from Tūtira. Uncertified but run on organic principles. Koanga Institute: In Wairoa, educates on organic principles and holds New Zealand’s largest organic heritage food and seeds collection, sold nationwide. BioRich: In Awatoto, the place for certified organic compost to build your soil. Pacific Wave Organics: Providing alternatives to chemical sprays and inputs from plant and sea. Ya Bon: Authentic French bread and pastries made with organic flour. Oh My Goodness: Gluten-free baking made from organic buckwheat milled on site. Stonecroft Organic Wine: Small, family-run operation over two vineyards. William Murdoch: Natural winemaking at Gimblett Gravels. Supernatural Wine Co.: Boutique biodynamic vineyard at Millar Road. Villa Maria Organic: Vidal’s Joseph Soler vineyard managed by Jonathan Hamlet. Weleda – Biodynamic skin and health care products grown in Havelock North and distributed internationally. Millstream Gardens – Home-grown cosmetics and health products. Pureborn Organics – Organic cotton babywear based in Taradale.